American author F. Scott Fitzgerald said it best, “Here’s to alcohol, the rose colored glasses of life.” In tribute to the art of toasting, The Cooper and head mixologist David Bouchard have concocted a liquid love triangle of colorful spirits that are both sublime and handcrafted to suit a bibulous palate. Mai Tai, Tahitian for “out of this world,” describes the Trader Vic Mai Tai ($10). It will have you longing for lush Polynesian breezes and tiki torches as you sip this tropical treat of Sailor Jerry Rum, Curaçao, lime, orgeat, and strong notes of vanilla. Pairs perfectly with Hawaiian T-shirts, string bikinis, and sizzling sunsets. The bright and refreshing Paper Plane ($10) cocktail was conceived by Sam Ross of Little Branch who credits its creation to British rapper, M.I.A., and her hip-hop hit, “Paper Planes.” It is a bittersweet love story of Evan Williams Bourbon, Aperol, and lemon, and also Amaro Nonino for an herbaceous, earthy finish. “This is a cocktail that I am truly fond of,” says Bouchard. “It’s a wonderful apéritif that I recommend sipping straight up.” The only problem is that it’s impossible to enjoy just one. The Cooper is also taking its popular, lazy Sunday brunch up a notch. Sweet and savory options will now be offered on Saturdays, starting October 3, including the all-you-can-sip mimosas and a Bloody Mary bar. 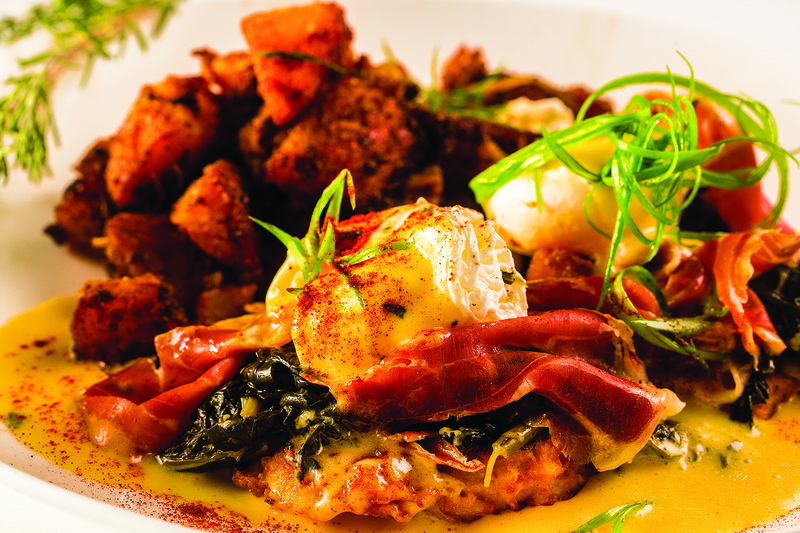 Executive chef Adam Brown’s thoughtfully executed classics range from Lemon Ricotta Pancakes and Cinnamon-Raisin French Toast to the fully loaded Crab Cake Benedict. The Cooper, Craft Kitchen & Bar provides sustainable, environmentally conscious food in a contemporary setting, with unparalleled service. The menu is influenced and inspired by fresh ingredients that are locally sourced and mindfully prepared. Complementing the menu are thoughtfully crafted artisan cocktails. These seasonal, barrel-aged cocktails are modern interpretations of classic drinks. The Cooper also offers a lively and international selection of wines and microbrew draft beers. The Cooper is located in PGA Commons at 4610 PGA Blvd., Palm Beach Gardens, Florida. Daily lunch hours are 11:30 a.m. to 4 p.m. Dinner hours are Sunday through Thursday, 4 p.m. to 10 p.m., and Friday and Saturday, 4 p.m. to 11 p.m. Saturday and Sunday brunch hours are 11 a.m. to 3 p.m.
For more information, visit thecooperrestaurant.com.